CCRI is a full member of the National Association of Schools of Music, 11250 Roger Bacon Drive, Suite 21, Reston, VA 20190-5248 Tel: 703-437-0700. 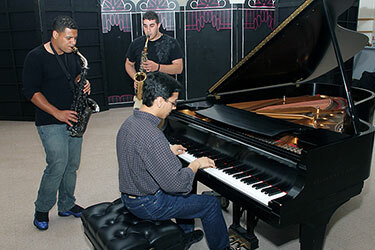 The Music and Jazz Studies concentrations prepare students for transfer to four-year colleges or universities. The two-year curriculum at CCRI is designed to provide music courses appropriate to the freshman and sophomore years in four-year bachelor’s degree programs in music and jazz studies. The CCRI program helps prepare students for careers in professional performance, private music instruction, arranging (Jazz Studies) or music education in the classroom. The curriculum is sequential, and students enrolled in the degree program should work closely with an adviser from the Music faculty (starting in their second semester) who is familiar with the program and its transfer requirements. CCRI Music and Jazz Studies graduates have transferred successfully to four-year colleges and universities both locally and nationally. The requirements below are for the Music and Jazz Studies concentrations, Associate in Fine Arts (A.F.A.) degree. Where possible, take courses in the order they appear starting with the 1000 level and moving up to the 2000 level. Take a balance of fine arts and humanities courses each semester. Studio courses are demanding and require additional practice, so plan accordingly. For detailed information, students should refer to this page.